Modus offers eight window and door designs – including rebate, slim rebate and fully flush sash – from one system. 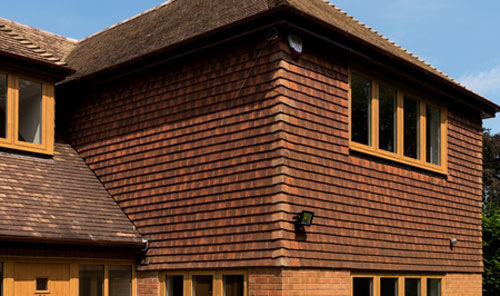 Combining modern materials with a traditional appearance, the Modus flush sash window delivers the aesthetic of timber yet retains all the performance benefits of PVC-U. Featuring a unique 75mm six-chamber profile system, the range delivers optimum energy efficiency performance and can achieve a U-value as low as 0.7 using triple-glazed units. Modus is also one of the very first systems to achieve the BRFC Window Energy Rating (WER) of A++. This is only awarded to windows with an energy index value equal to or greater than +20; and Modus A++ designs include casement, reversible and tilt and turn. Consisting of 50% post-consumer recycled PVC-U as standard, this range of doors and windows has a smaller carbon footprint than products made or recycled outside of the UK. Eurocell achieves this by employing dual material extrusion technology (DMET) that layers post-consumer recycled and ‘virgin’ material simultaneously, so the recycled material is concentrated in the central core of the profiles where it cannot be seen once the door or window is installed. Coming with a 12-year guarantee, the Modus system is available in nine solid and woodgrain-effect colours, all of which are available with white internal finishes to create a light and airy living environment. A further range of more than 40 solid and woodgrain effect finishes is available, including colour both sides.